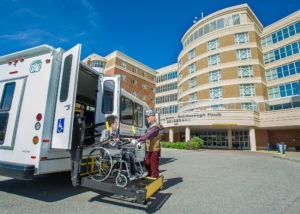 Transportation enables seniors to participate in our community programs such as the Adult Day Program and Congregate Dining, attend medical appointments and take shopping trips. The service helps support an independent lifestyle, enhance community involvement and improve social functioning. East/west: Markham Rd. to Don Mills Rd. East/west: Neilson Rd. to Kennedy Rd. South/north: Ellesmere Rd. to Denison St.
South/north: Steeles Ave. to Major Mackenzie Dr.
For attending Yee Hong’s community-based programs, fees depend on distance and range from $8-14 for a round trip. For attending medical appointments, there is a flat rate of $16 for a round trip.